These guys are great! I love how friendly and helpful the staff were during the cruise. They were very knowledgeable, the captain is hilarious, and the whale watching included Orcas, Minkes, a Sea Lion, Seals, and Eagles! For a 5 hour tour, I might suggest packing a good amount of food (they have some, but I preferred what we had). We saw sea lions,porpoises, bald eagles and minke whale during our outing. The indoor seating was great but there is almost no outdoor seating. The adults in our group loved the length of the trip but the kids were getting restless. The crew was great and the chili was excellent! It was a great day to see whales! The highlight was seeing an orca throw a porpoise into the air and then catch him. The crew was fun and informative. I would do it again! I have been a guest on The Mystic Sea Charters 3 times and each time is better than the last. Monte (The Captain) is wonderful. He and his wife have taken care of me over the years. The 1st trip I made was after I finished chemo for breast cancer. Each time I return I feel like family. The last time I went out all 3 pods of Orcas were together. I actually cried at such a sight. Even the crew ststed that was so rare to see. I can not speak highly enough about this boats crew and the expeirences they have provided to me, my family and friends. As a matter of fact I am getting ready to call and purchase tickets for my next trip in June. Heads up Monte her I come again. do your self a favor, do not book on any other boat. You have found the best. My first trip on a whale watching boat! I didnt have any expectations but since I've been on plenty of tour boats I was looking forward to a nice pleasant cruise. What I found was an amazing educational experience and a beautiful day filled with exciting moments searching and finding magnificent Gray Whales. Captain Monty started the morning with a safety briefing and his itinerary for our day. Just minutes out of the marina we were spotting sea lions and white bald eagles. It was a perfect day at sea with a warm breeze and plenty of sun shine. Most of the sightseers on board were on the bow of the boat with binnoculars along with Max (first mate) spotting blows 30 minutes into our cruise. My solo trip quickly turned into teamwork searching the waters along with the other passengers and the crew. To my amazement two mammoth whales were spotted by several passages and put on quite a show. On the way back to the marina Captain Monty invited a 12 year old boy celebrating his birthday into the pilot house to help steer us back to shore. I can't wait to take my grand-kids on the Mystic Sea, the crew was friendly and helpful and provided a breathtaking and memorable day. We had a terrific day with a crew that shared the great excitement and lots of information. THANK YOU ! WOW!!! Awesome customer service and great tour. The staff ensured we saw the gray whales and was attentive to their customers. Suggest you pack a lunch as their website suggests. Will definitely come on another tour with Mystic Sea Charters. I've lived in the Seattle area for 8 year now and yet to see a whale. Brought my younger sister from AZ on this whale watching adventure. It was rainy and I didn't think we'd see anything. We saw a whale 20 mins after departure. Saw 4-5 total, very cool experience. Captain and his crew are very informative of the whales. The boat is small and the crew is low-key and friendly. On the way to see the Orcas (we were first on the scene), we saw eagles, seals and other sea life. The crew were extremely knowledgeable and could answer all our questions. Their naturalist also took amazing photos which we viewed online afterwards. We will definitely go again next spring! Very comfortable and informative. Dress warm and pack a lunch although they have some food for sale. They guarantee whale sightings and the three times we were out we saw orcas. A most awesome reunion with Puget Sound. Perfect weather, gracious hosts, great sites and many Orcas. Returning to Washington for a reunion, I wanted to spend some time on the water and this was a perfect way to do it. 5 hours plus on a big comfortable boat, looking for orcas was the goal of the trip, but the sites of Puget Sound was what I was after. I really appreciated that and additionally saw dozens of orcas in good company. We had a beautiful day for our whale watching tour. The crew was friendly and knowledgeable. Leaving out of Anacortes was great; no ferries to hassle with and we left late enough that coming from Seattle didn't require an over night stay. We had at least 6 hours on the boat, most of which we spent on the deck. Of course if you get cold you can warm up inside and grab a snack. The facilities were small but clean. We saw harbor seals, fish, porpoises, all types of birds, Minke whale and the stars of the show, nearly 40 Orca Whales. We were told there were 3 different pods (I believe J, K & L). We saw them breaching completely out of the water and smacking into the water with a huge splash . A few times they swam under our boat and we got to see two of them feeding, proudly displaying the fish they caught when popping their heads out of the water. The naturalist and captain were quick to point out any points of interest and nature at its best. We loved this trip and saw much more than we imagined. The only complaint was the mic and speaker system could be louder. I would recommend this tour for anyone at any age. As we approached the boat from the dock, the Mystic Sea stood, underwhelming at best, in the shadows of its local competition. We shimmied past the long line for the "other" boat, and settled ourselves onto our uncrowded, welcoming, and friendly vessel. We were greeted with smiles and laughs by the captain and the first mate, and though the boat's shabby exterior wasn't going to turn any heads, we new we were going to have a good time. The communal seating environment provokes friendly conversation with fellow whale seekers, and the first mate made a point to walk around and talk to every body as we headed out to sea. Both her and the capt kept us informed along the way, pointing out natural wonders and hidden gems, from familiar fidalgo bay and beyond. But captain Kent clearly was in the know. Before long we came upon a gaggle of transient orcas in the midst of a kill! They were breaching, tail slapping, making so much commotion. It was epic! We followed them in their frenzy for a good hour or so before we noticed the "other" boat had finally found their way to our good fortune. Too bad for those whale seekers, the finale seemed to occur just as they arrived. All in all, we are so glad we chose Mystic Sea Charters! Truly an adventure to remember that did not disappoint. Captain and crew were friendly and knowledgeable, and the casual, warm-hearted, unpretentious environment made it feel like a day out with family and friends. Personalized, fun and friendly service – come aboard for a splendid time! JOIN US FOR A WHALE OF AN ADVENTURE! Mysterious in mist or sparkling in sunshine, the Puget Sound and San Juan Islands are always changing and always beautiful. Come aboard the classic 100 ft. Mystic Sea for our guaranteed whale watch and wildlife cruise and enjoy a fun and relaxing day on the water. Learn about the history, lore, and hidden nooks of this unique area from our friendly and knowledgeable crew, and make memories for a lifetime! We explore 80-90 miles on our Orca whale watch cruises and have a spectacular array of wildlife that migrate into these calm waters at various times and stages throughout the year; everything from Bald Eagles and Puffins, to White Sided Dall's Porpoise and Alaskan Steller Sea Lions. 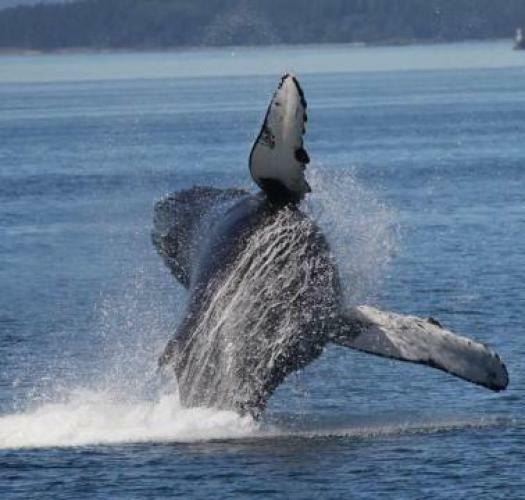 We have several different types of whales in addition to the 86+ Resident Orcas, including Minkes, Humpbacks, Gray Whales, and Transient Orcas . . . the true 'killer whale'! Call us, or go online today to book your tour!